Bahrain's former capital and third largest city, Muharraq has a long history dating back to approximately 3000 BCE. From ancient times until the 1930s the primary economic activity was pearling; today the city is known as a center for the arts and as one of the most religiously conservative districts in Bahrain. In 2012 parts of Muharraq Island were collectively inscribed on the UNESCO World Heritage List because of their association with Bahrain's long history of pearling. These sites include seventeen historic buildings, Abu Mahir Fort, and three offshore oyster beds. 26.27083350.6336111 Bahrain International Airport (BAH IATA). This is where Bahrain's international airport is located, and is the main base for Gulf Air with excellent connections throughout the region and London. The airport has good duty-free shopping; a Transhotel offering beds and showers (for a fee) to those awaiting flights is undergoing renovation. From Manama you can easily get to Muharraq using one of the 3 modern causeways: 'Sheikh Isa Bin Salma', 'Sheikh Hamad' and 'Sheikh Khalifa Bin Salman'. All of them will lead you to the airport. Pearl Trail. This is a self-guided walking tour connecting the 17 historic buildings included in the UNESCO listing. It is being developed by the authorities, marked with blue paving stones, recessed lighting, and signage. 26.2538550.612871 Sheikh Isa Bin Ali House (Beit Sheikh Isa Bin Ali). 26.253950.610712 Siyadi House (Beit Siyadi). 26.2538950.610713 Abdulla Al Zayed Press Heritage House. 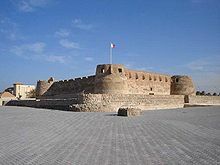 26.2413150.613524 Abu Mahir Fort (Bu Maher Fort, Muharraq Fort). Fort was built to protect against western approaches. It was constructed upon the ruins of a much older fort, on Abu Mahir island. Fort is rest against the coastline and give beautiful sea views. 26.2524850.627155 Arad Fort, Road 4233 (close to Bahrain Airport). This fort was built by Arabs in the 16th century. It was captured by the Portuguese around 1559 and then in 1653, Omanis seized it. Today, cultural events and shows are frequently held in the fort. 26.2632450.616466 Al Oraifi Museum, ☎ +973 17335616, fax: +973 17536788, e-mail: oraitigal@batelco.com.bh. Sa-Th 8AM-1PM, 4PM-8PM. This museum was opened by artist Rashid Al Oraifi in 2010 to display arts from the Dilmum era. It holds over 100 pieces. BD 1. 26.2480150.620137 Dhow shipyard. Daylight hours. Traditional wooden Arabian dhows are built here by hand, in the last dhow shipyard in Bahrain and one of the few remaining in the Gulf. Free. Drive to Amwaj, a far more developed "western-friendly" residential compound that is 10 minutes away from the airport. It has top-notch hotels and resorts such as The Dragon, and pricey restaurants to choose from, such as Burger Lounge, or the more luxurious Mojo - which also comes with a bar and a nightclub. The city has shopping (at the Lagoon), restaurants, spas, salons, apartments and hotels are still on their way. 26.2500250.610111 Muharraq Souq. 10AM-1PM, 4PM-9PM. Muharraq is known for its traditional market. Full of variety of shops selling fresh fruits and vegetables, local crafts and everyday products, you can also purchase traditional Arabic sweets, halwa which are made in Muahrraq. Jasmi's, ☎ +973 17676999. The most popular Bahraini fastfood chain. 2 BD. There are no bars in Muharraq, which is a conservative city. However, you can enjoy a stay at the various Gahwas all around the city for Sheesha (Hookah), mint tea, Turkish coffee, Arabic coffee, or fresh juice. 26.2644650.626021 Mövenpick Hotel Bahrain, 143 Road 2403 (Opposite the airport), ☎ +973 17 460 000, fax: +973 17 460 001, e-mail: hotel.bahrain@moevenpick.com. BD 90+. Swiss flair and traditional Arabian hospitality. Overlooks a lagoon and features a fine dining restaurant, international bar, atrium lobby restaurant, pool bar, parking area and two outdoor tennis courts. 7 min driving distance from the city. Babysitting service, business centre, gym, spa, swimming pool, tennis courts. 24-hour room service, internet, mini bar, satellite TV, tea and coffee making facilities (on request). It is best to dress "modestly" when in Muharraq City: avoid shorts and sleeveless tops. This city travel guide to Muharraq is a usable article. It has information on how to get there and on restaurants and hotels. An adventurous person could use this article, but please feel free to improve it by editing the page.